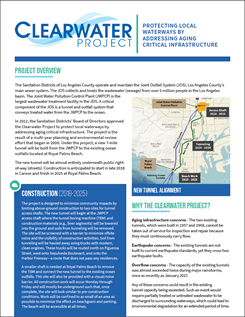 The Clearwater Project uses modern technology to construct a new tunnel from the Joint Water Pollution Control Plant in Carson to the existing ocean outfalls at Royal Palms Beach. Multimedia resources are provided to help you learn about the tunneling technology and the accompanying monitoring systems that will be used to ensure safe and controlled construction. This 5-minute video provides an overview of the Clearwater Project including what the project is, why the project is needed, and how the project will be constructed. Este video de 5 minutos proporciona una descripción general del Proyecto Clearwater, que incluye lo que es el proyecto, por qué se necesita el proyecto y cómo se construirá. 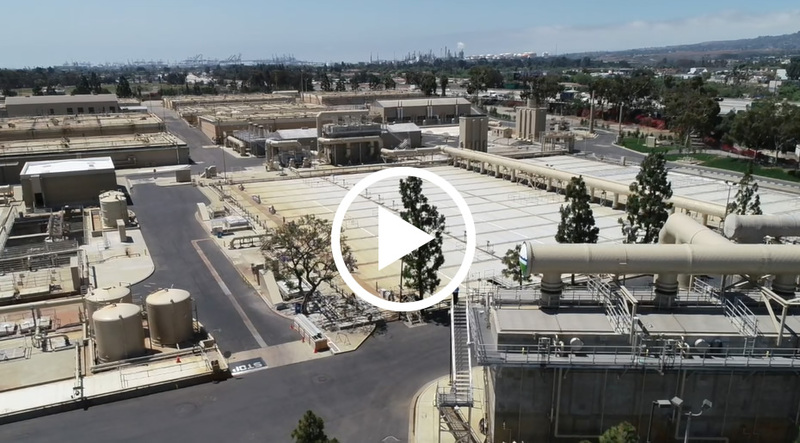 This video includes aerial footage of the Joint Water Pollution Control Plant (JWPCP) in the City of Carson, which currently processes approximately 260 million gallons of wastewater per day and is the Sanitation Districts' largest treatment plant. The footage also shows the location of the potential Regional Recycled Water Advanced Purification Center, which could become the nation&apos;s largest water purification facility. Today, tunneling is done with a very sophisticated machine that controls every aspect of boring through soil and bedrock. Watch this fascinating video to learn more about the tunnel boring technolgy that will be used for the Clearwater Project. Since 2006, the Sanitation Districts have conducted over 500 outreach meetings to inform communities about the Clearwater Project. 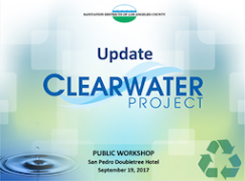 This presentation was given to the San Pedro community on September 19, 2017, as part of a workshop on the project. The Sanitation Districts held a public workshop on Clearwater Project Construction on March 27, 2018, at the Wilmington Senior Center. This is a narrated version of the presentation given at that community meeting. 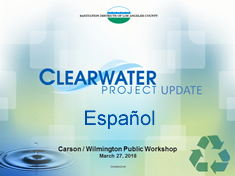 Los Distritos Sanitarios llevaron a cabo un taller público sobre la construcción del Proyecto Clearwater el 27 de marzo de 2018 en el Wilmington Senior Center. Esta es una versión narrada de la presentación que fue presentada en esa reunión comunitaria. 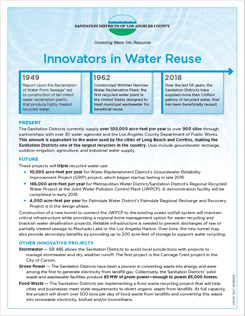 This fact sheet highlights the Sanitation Districts' leadership in water recycling over the last 50 years. Information is presented on past achievements and future projects. An overview of the Clearwater Project and a description of the upcoming construction are provided. Above-ground construction will be limited to the southwest end of our Joint Water Pollution Control Plant in Carson and at Royal Palms Beach in San Pedro. Un resumen general de Proyecto Clearwater y una descripción de la construcción que viene son proporcionados. La construcción por encima del nivel del suelo se limitará al extremo suroeste de nuestra Planta de Control de Contaminación del Agua en Carson (en inglés "Joint Water Pollution Control Plant") y en Royal Palms Beach en San Pedro.